This weekend is the Cubs Convention, and I’m legitimately excited – it’s always a good bout of fun, both during the actual convention and after with all the friends and whatnot (go to Lizzie McNeill’s after the Opening Ceremony). But every single year I’ve gone – this’ll be my fifth – I can never shake this feeling that they’re going to announce some surprise player at the introduction. They did it with Kerry Wood back in the day when he re-signed, and I just want to be a part of that kind of moment so badly. 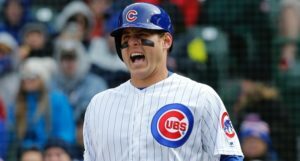 The Atlanta Braves would reportedly like to sign A.J. Pollock this winter, but the prospect penalties they’ve incurred for malfeasance on the international market are standing in their way. Indeed, despite far weaker penalties for signing a player attached to draft pick compensation than we’ve seen in the past, the Braves are not particularly keen to lose their third overall pick (around the mid-60s) to get him. But I gotta say … I don’t think that’s all that wise. I know that they’ve lost a lot thanks to the discipline (13 IFA signees, future IFA bonus dollars, etc. ), but they have two first-round picks this year, both of which are not at risk of being lost by signing Pollock, so … what’s the big deal? There’s not one. If they actually want him, this shouldn’t be standing in their way. Of course, teams like the Phillies, White Sox, and Dodgers, who also have interest in Pollock according to Ken Rosenthal, might. For what it’s worth, Rosenthal also suggests that the White Sox remain in the Bryce Harper pursuit, which is just important to note, given the increasingly loud Manny Machado news over the past week or so. The Brewers might consider trading Eric Thames and/or Matt Albers to create some financial flexibility to bring back starter Wade Miley for another season. Miley impressed in his half-year with the Brewers (16 starts, 2.57 ERA) and could help out that rotation quite a bit. We’ve long been expecting that move, so I’d prepare mentally for it. In addition to Miley, the Brewers are looking at bringing in Mike Moustakas via free agency or Joe Panik via trade. Moustakas, for what it’s worth, remains on the radar of the Padres, but they might also have the Phillies’ Maikel Franco on their radar, according to Rosenthal, so that remains a jumbled mess. Are you ready for it to get even more jumbled? Brett discussed this a bit last night. In a later tweet, Lin wrote that the Padres interest in Kluber is “primarily to flip him,” because he doesn’t fit into the roster age-wise. “If they could get Kluber, they likely would want top Reds prospect Nick Senzel, whom Cincinnati does not want to move.” A three-team trade between the Reds, Padres, and Indians including Kluber and Senzel!? Whew. That’ll be something. I’m still not sure the Reds are quite at a place where they can compete in such a tough NL Central, but adding Kluber to Yasiel Puig, Eugenio Suarez, Scooter Gennett, Joey Votto, and a great bullpen would make you wonder. The NL Central, man. They’re fed up with the Cubs. And the NL East has not stopped yet, either: Andy Martino and Ken Rosenthal have heard that the Mets could look to trade Travis d’Arnaud and sign a different backup catcher via free agency, as they look to improve their starting pitching depth. 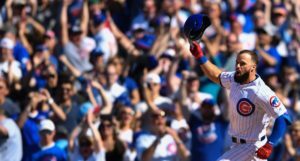 At 29 years old, d’Arnaud maybe not fit the wise, old veteran model we thought the Cubs would target to back up Willson Contreras, but he does have plenty of experience and is a good pitch framer. He’s also making just $3.515M in 2019, his final year under contract. Unfortunately, that extremely low cost might make a swap involving, say, Tyler Chatwood, difficult. 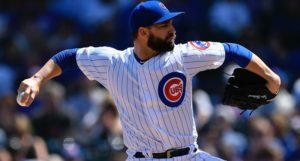 Then again, Tyler Chatwood might make a swap involving Tyler Chatwood difficult, so maybe the Cubs can find a way to make it work – maybe they can even save some precious 2019 dollars in the process. Can we interest you in a lightly used Brandon Kintzler or Brian Duensing? The Giants have re-upped with Derek Holland, who gets one year and $7 million guaranteed, with an option year thereafter. Next Post Next post:Can I Interest You in Some Chicago Cubs Rotation Positivity?